Take a good care of the Fox family and they will reward you significantly in the NextGen 5-reel 3-row video slot machine with 25 fixed paying lines, Wilds, Scatters, Random Bonus, Free Spins and the innovative SuperBet feature. 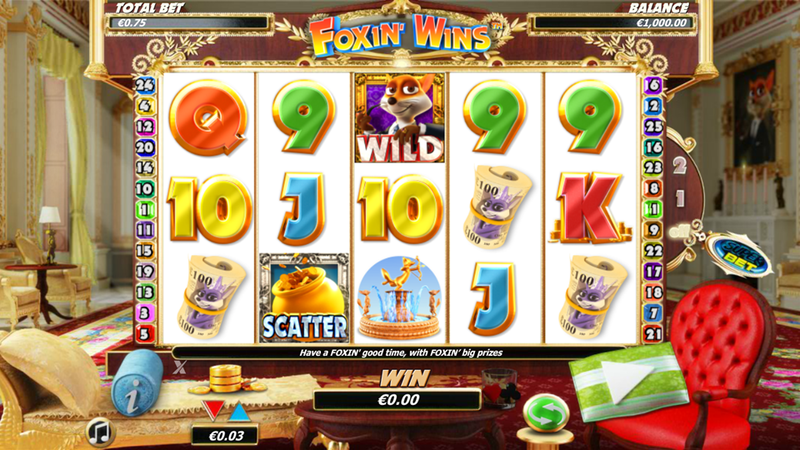 Read the Foxin’ Wins slot review and learn how to see your name on the leaderboard. Want to see how Foxin' Wins works? Select a recommended casino site from the list below and start playing for free or real – our screenshots will give you a sneak peek! Form a winning combination with 3 or more matching icons and get paid according to the paytable. Fox is the wild and icon with the highest rating, able to jump in instead of a missing symbol, but can’t replace the scatter. Collect 5 of the kind to land 2000 coins. You can get an additional chance to win since the Fox Pup is able to turn Wild at anytime. Using the SuperBet feature, you can get an additional wager and Fox Pup inside a single reel, 3 or all 5 reels. In order to turn it on, you’ll have to pay 25, 35 or 50 coins. There is also a chance to trigger the Random Bonus, no matter the outcome of your spin. Get the Leprechaun Showdown or Fox Funds to score a big win. Finally, there is a variety of betting combinations thanks to the coin denomination from €0.01 to €25. When 3 or more Pot scatters appear anywhere on the reels, you will trigger the Free Games Feature and receive 10 free spins at the casino’s expense. Fox Pups symbols will appear more frequently during this bonus round and all your winnings will be multiplied. Tips: in order to re-trigger this round for an indefinite number of times, look for more scatters. The game works on all mobile devices including Android and iPhone. There is no need to download any app and you can try it for free directly from a browser. 3. What is the RTP factor of Foxin' Wins? The theoretic RTP across the NextGen powered sites depends if you play with the SuperBet feature turned on or off. Basically, the winners can expect 95.223% without the mentioned option and RTP between 95.33% and 95.618% with it. Interesting, rewarding and packed with innovative options, the game pays every now and then, therefore more suitable for experienced players, but the novice players can also try their luck.